Q1 .How to setup wireless security key? Q2. Why I can't still get Internet after I have followed the instructions on the Quick Installation Guide? Q3. ​How to stop someone use my powerline network? Q4. Do I have to install the Utility from CD before I can use the Powerline? Q5. Where can I download the Quick Installation Guide, the User Manual and the Software Utility? Q6. Can I add a second NHP5010 wireless unit to my existing powerline network? Q1. Why I cannot access to my APR3000N WiFi Range Extender management page at 192.168.10.253 ? Q2. How to Reset WiFi Range Extender? Q3. Where can I download the Quick Installation Guide? Q1. How to setup wireless security key? By default, the DHCP server is disabled. You need to set the IP address manually before you can login to NHP5010 management page. Please make sure that you are currently connected to the NHP5010 by ehternet cable or by wireless. Select Use the following IP address and enter the IP address of your PC. Set the IP address to 192.168.99.123, set the subnet mask to 255.255.255.0 and set the default gateway to 192.168.99.1. Open the web browser; enter 192.168.99.1 in the address bar. NOTE: If you are unable to reach the management page, please click here. Type the default username: admin and password: admin. You can choose different security type from dropdown list. For example, you can choose Security Mode WPA2-Personal, select AES for WPA Algorithms and enter your network key into “Pre-Shared Key” field. Go back to Internet Protocol Version 4 (TCP/IPv4) Properties, select Obtain an IP address automatically and Use DNS server address automatically and then click OK.
You will be disconnected automatically if you are using the wireless connection when you setup the wireless security. Please wait for few seconds and reconnect to it by entering your network key. 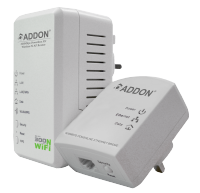 Make sure that the Addon HP5100S (the wired unit - small one) is connected to the router before reconnecting the PC or laptop to the Addon NHP5010 (wireless unit - big one) by wireless. If you cannot access the Internet after reconnecting to wireless Powerline, then turn off the Addon NHP5010 and turn it on again. Connect your PC or laptop to the Addon NHP5010 again. You should be able to access the Internet. Go back to Internet Protocol Version 4 (TCP/IPv4) -> Properties -> Select Obtain an IP address automatically and Use DNS server address automatically​ -> Click OK.
Connect your computer to the powerline by Ethernet cable and start to follow these instructions from the point 1 (make sure to plug the Ethernet cable properly and that the Ethernet cable works). Powerline / Homeplug system can only work in the same electrical ring. You need to make sure the wall outlet for powerline units must be in the same electrical ring. For a test, you can put Powerline units in the same room; make sure the date lights on both powerlines are on (If the date lights are not on, the two powerlines are not talking to each other). If you can get to work in the same room, then the powerlines are OK. The original wall outlet for second powerline may not be in the same electrical ring as the one you connect to your router and cause the trouble to get Internet. Once you proof that the powerlines are OK, then you can try the different wall outlets for second powreline. Connect your powerline to your windows based computer. Change Private Network Name from default name to another. Repeat above steps for your second Powerline and make the same Private Network Name as the first one. Now someone adds the third Powerline into your network, he will not get internet if he doesn’t know the Private Network Name. You don’t have to install the Utility before you can use the powerline. And it only supports for Windows machine at moment. If you cannot access this WiFi Range Extender management page at 192.168.10.253, please RESET your device to manufacture settings. It normally happens by typing the wrong Network Encryption Key. So please type the Network Encryption Key very carefully and make sure it is correct. You can click to Unmask for check it. It is case sensitive, so make also sure if you are typing in uppercase or lowercase. For reset the WiFi Range Extender, please press the button hole on the right side of the device (RESET) with a thin instrument for 10 seconds and then release it (The WiFi Range Extender must be plugged into the electrical outlet). The system would be restored to the factory default settings and you would be able to start the configuration from the begin by following the Quick Installation Guide.